Just above the IP is the server version. So check your minecraft version, you can do that by, clicking the arrow on the right side of where it says "play". For Resource packs you have to download it, the press the windows button that looks like this either on your keyboard or your screen. Then, simply dragging the resource pack from your downloads to the "recourcepacks" folder. Then once you've chosen your version of minecraft you want to play, go to options, and then resource packs. To load a pack click the arrow on the image of the pack, and wait a minute. Depending on the pack you want it'll take a few seconds or even minutes before it loads. 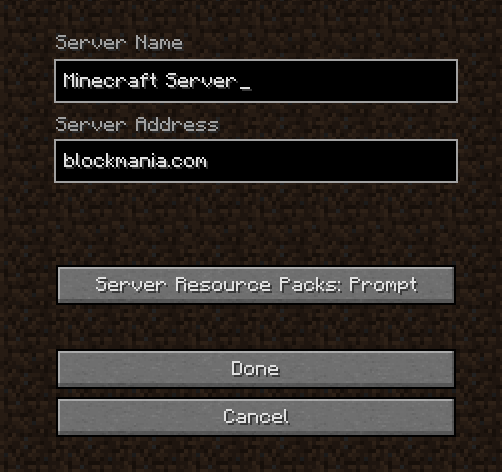 Once thats done, go to multiplayer, add server, paste the server IP address in the "Server Address" portion. Oh, yeah with PE everything is alot more figity, and I don't believe you can connect to servers using PE. Sorry mate. server: go to the server's page and copy paste the IP. NOTE! check the game version! if its a 1.8 or whatever server its not compatible with game version 1.13.2 for example. You need to copy the IP of a server and enter it in your Minecraft client. Make sure you're on the right Minecraft version and update. Java / Bedrock? Which update version? Also note that you won't be able to join whitelist (exclusive) servers without submitting an application. Another thing to keep in mind is that you shouldn't have any spaces in your IP field (an easily made mistake). To use a resource pack you have to save it in the right folder in your %appdata% > .minecraft folder in your file directory. Merely downloading it won't cause it to show up in the game.